Check out the equipment on this page or click on the links for other equipment categories. Please leave your questions and comments! gear that's right for you and your production? In these pages you'll find the equipment I recommend with links to get more information and purchase. Note that most of the links are affiliate links so you'll help support this site by clicking on them for your purchases. 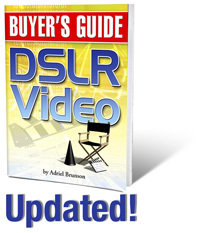 If you need more information I suggest checking out the new and updated DSLR Video Buyer's Guide. Besides equipment recommendations, it's packed with tips, tricks and techniques that will help you get started successfully in DSLR video. and discover what's right for you! Please leave your comments and questions, let me know how I can help you get into the DSLR video game.